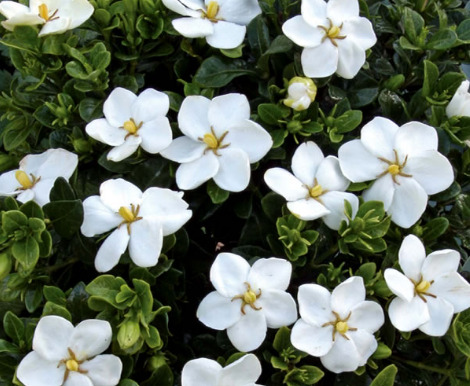 nice rounded evergreen shrub with glossy green foliage and very, very fragrant white flowers. Blooms are pure snow white when first opening, and then take on a creamy color as they expire. Each individual bloom and also has a small yellow center, which looks almost "button like". Blooming time begins in mid May, and continues right on thru the entire month of July.......even later in some climates. Blooms are extremely fragrant, and we recommend these plants be located somewhere that will have plenty of traffic & activity around, in order for everyone to enjoy the wonderful fragrance.